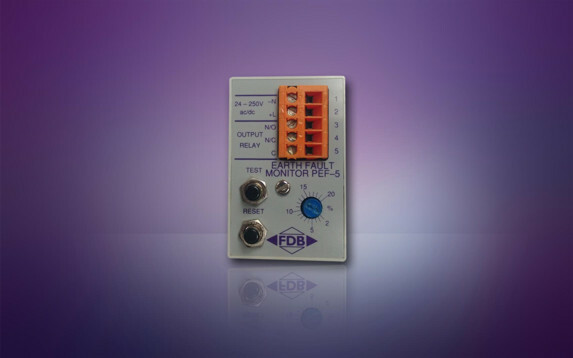 The engineers here at FDB Electrical developed the PEF-5 Percentage Earth Fault Unit for high KA capacity installations needing a practical, cost-effective method of detecting potentially dangerous earth fault currents before damage is caused to contactors, cables or plant. We found that zero sequence C.T.’s can be costly and difficult to install, particularly in retro-fit applications, whilst traditional types of spill current earth fault protective devices have the disadvantage of being somewhat crude in accuracy. Therefore the PEF-5 was developed to provide an optimum solution and can be set to detect leakage currents as low as 2% of load current simply by utilising the existing protection or instrument C.T.’s. We believe that in 98% of applications the C.T.’s used have 5 Amps secondaries and so the PEF-5 is designed to monitor the secondary current accordingly. On a 100.5 C.T. installation the PEF-5 can detect as low as 2 Amps of earth fault current which, in industrial applications, provides the capability of accurate earth leakage detection as well as earth fault protection. In a typical application upstream fuses are installed to rupture on a short circuit between phases or between phase to earth. This is normally defined as Class C coordination and will provide the necessary protection against a short circuit between phases. However, in the event of a short circuit to earth where continuity has deteriorated due to terminal corrosion or a loose connection, then a short to earth becomes current limited and will not “blow” the upstream fuse fast enough to prevent the contactor opening under high overcurrent trip. This can result in destruction of the contactor or at least damage to a phase contact. In the latter case, a major problem could occur in a motor installation since current imbalance on one phase (whether or not due to an earth fault) is a linear factor of current rise and therefore measurable. However, if a contactor phase contact has been damaged due to the condition described above, then a volt drop across that contact will occur, giving rise to a voltage imbalance to the motor. Typically, for every 1% of voltage imbalance on a 3 phase motor, the effective internal current increase (not externally measurable) will be approximately 8 times as high. Thus a 3% or 4% volt drop across any phase contact can result in the total burn-out of the motor connecting to that contactor. The PEF-5 percentage earth fault unit can be used to provide early warning of fault current as low as 2% of load current or can be set to take a motor off line immediately a dangerous earth fault occurs, thus dealing with these potential problems. Share the post "PEF-5 Percentage Earth Fault Protection Unit"